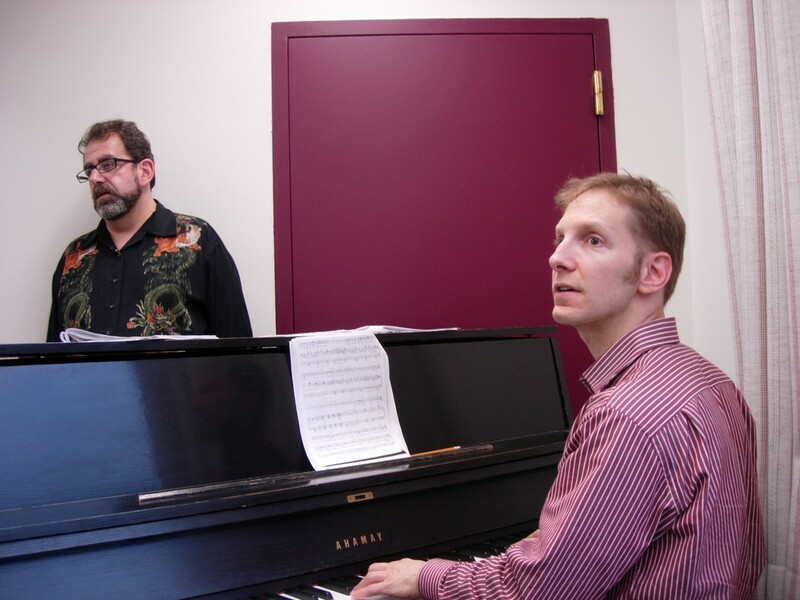 David Reiffel (Treasurer, AWL Facilitator): For five years, David Reiffel was composer in residence for the nationally-acclaimed Cornerstone Theater Company. With them, he created full scores for sixteen adaptations of classic plays, of which his favorites were The House on Walker River (based on the Oresteia), The Good Person of Long Creek, and Pier Gynt (a Downeast adaptation of Ibsen's epic). His murder mystery musical Say Goodbye was selected as the inaugural Louis B. Mayer Memorial Production at Harvard University. He has served as musical director for JoAnne Akalaitis’s production of The Iphigenia Cycle, both in Chicago and in New York City. Over the past several years, he has collaborated with poet/librettist Mary-Ann Greanier on The Underpants and Chairman of the Board, two adaptations of plays by Carl Sternheim whose development began with Cornerstone. He has also worked with director/playwright Timothy Banker on several productions, including The Lady From Maxim’s. He is Program Director for the New Opera and Musical Theatre Initiative (NOMTI), which selected The Lady from Maxim’s for its Birth of a Musical festival in both 2001 and 2003. In the NOMTI Advanced Writers’ Lab he recently finished the musical Glory, for which he wrote book, music, and lyrics. The Lab also developed the musical Cupcake, for which he wrote lyrics (to Michael Wartofsky's music and Bradley Seeman's book). Cupcake had a hit seven-week run at Boston's Club Cafe in the late spring of 2012. David also has a thriving career creating original music and sound design for theaters in the greater Boston area and across the United States. Nancy Rexford (Secretary, AWL Facilitator): Nancy Rexford has been active in NOMTI since 2001, where she cleverly made herself indispensable by taking responsibility for NOMTI’s financial records and reporting, a job no one else ever wants. Nancy became notorious within the group for insisting that everyone focus just as much on book as on music, having discovered that pretty music ain’t enough. When life permits, she practices what she preaches, and has written the libretto for an opera (Komachi, based on a 14th century Japanese Noh play) and also the book, music and lyrics for two musicals (George Sand and Princess and the Goblin), all three of these in collaboration with composer Charles Turner. She has also written a set of 27 art songs called Prayers from the Ark, based on poems by Carmen Bernos de Gasztold, translated by Rumer Godden. Marshall Strauss (director at large): Marshall Strauss has been active in the not-for-profit field for more than a quarter century. He is the CEO of the Workplace Giving Alliance, a collaboration involving several non-profit federations active in the Combined Federal Campaign (CFC). Mr. Strauss served as chair of the National CFC Committee for two years and has helped found several CFC federations. He was a member of the CFC's 50th Anniversary Commission, charged with revitalizing the Combined Federal Campaign. He has also served on a number of national and local not-for-profit organization boards. During the early 1990s, Mr. Strauss helped establish and served as the initial CEO of two international organizations whose programs supported democracy activists overseas: The Democracy for China Fund and Freedom Channel. As executive director of the former, he organized and participated in the 1991 human rights delegation to China led by Congresswoman Nancy Pelosi. During his tenure at Freedom Channel, that organization produced and aired on nationwide Russian television numerous human rights documentaries. During the 1980s, Mr. Strauss served as associate director of Physicians for Social Responsibility and the Child Welfare League of America. Earlier, he served as special assistant to Massachusetts Governor Francis Sargent and special assistant to U.S. Senator John Durkin, among other positions. Strauss was a research associate at Tufts University's Fletcher School of Law and Diplomacy from 1994-96, and an adjunct member of the faculty of Emerson College in 1995. Here and overseas, he has been interviewed extensively on issues of human rights and philanthropy by, among others, the Associated Press, UPI, New York Times, Washington Post, Boston Globe, ABC News, Actuel (Paris), BBC, Russian National Television, and the Chronicle of Philanthropy. Leah Miles (director at large): Bio to come.